KATMANDU, Sep 11: Tourists as well as expeditors in Everest (Sagarmatha) region now will be able to consult doctor if they experience any health problems. 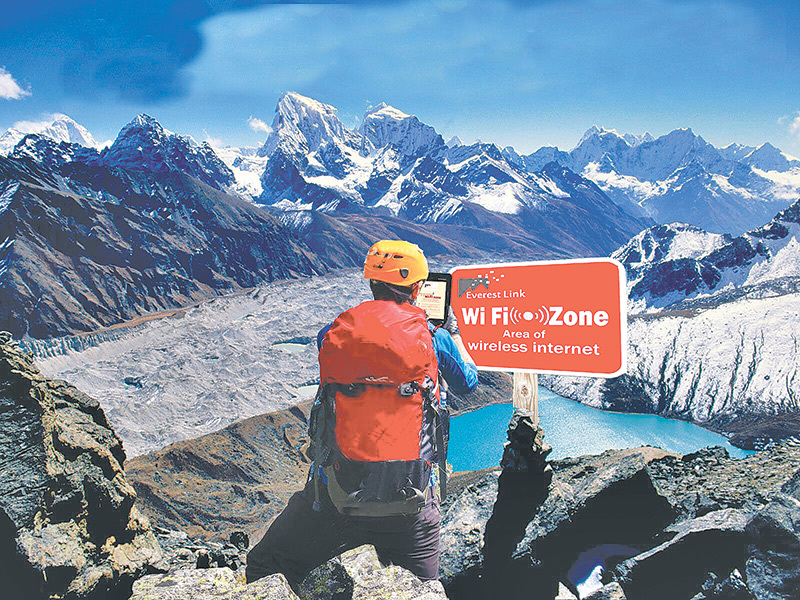 ISP Everest Link, which has been providing internet services in Khumbu since a few years, is set to start the “Hello Doctor” service free of charge. “We are going to start the service during the tourism seasons with the help of two hospitals in the capital and one in Khumbu itself,” said the CEO of Everest Link, Chhiring Gyaljen Sherpa. According to him, doctors in Greencity Hospital and Swacon Hospital of Kathmandu quickly agreed to lend their medical expertise for the service. Khunde Hospital of Khumjung has also agreed to be a part of the medical service. Even though Everest Link has been working to provide internet service in the Everest area for a long time, it has only been able to provide reliable internet connection for three years. While the “Hello Doctor” service will be free of cost, tourists will still have to pay for the internet connection. An emergency call will be available through the log-in page of every Everest Link router, said its IT Chief, Chehen Lama. “There will be an emergency call option,” said Chehen, “using which you can directly get a video call with a doctor at one of our contacted hospitals. And you can get consultation on your medical problem.” This will greatly reduce the number of lives lost every year at the Himalayan regions. Patients in critical condition will also be able to get immediate rescue through collaboration with Himalayan Rescue Association. The Everest Link internet service is available all the way from Lukla Airport to Everest Basecamp. Fakding, Feriche, Lobuche, Goraksep, Kalapatthar and the basecamp are the main places where its internet services are available. The 215 hotels of Khumbu are reaping great profits through Everest Link. The company has been providing its services through collaboration with the locals. Domestic tourists are given a discount of 50% when purchasing internet data. In order to use the internet, one has to buy cards of 100 MB or 200 MB. Foreign tourists are charged Rs. 200 for the 100 MB cards and Rs. 500 for the 200 MB cards. According to Gelu Sherpa, a local of Dingboche, Everest Link has become the chief option as the services of Nepal Telecom and Ncell are unreliable in the area. The company has informed that having to work in the high-altitude Himalayan region presents many challenges. Lack of manpower and battery backup has presented significant problems for the company. The company, which started with an investment of two crore rupees, has started preparations to extend its services to other Himalayan regions of Nepal. CEO Chhiring Gyaljen Sherpa has informed that work has already begun to extend services to Manang, Mustang, Makalu and Arun Valley, anlogside Bung, and Cheskam areas of Solukhumbu. Everst link also aims to work in the field of smart agriculture development.